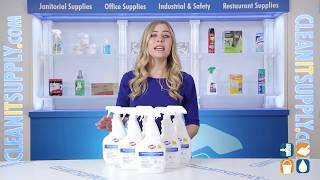 Ready-to-use spray cleaner disinfectant. 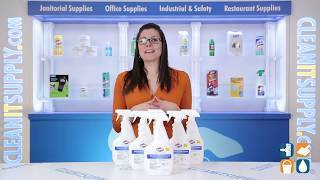 Cleans and disinfects environmental surfaces and medical equipment. Use in one step on hard nonporous surfaces including hospital, veterinary and food contact. 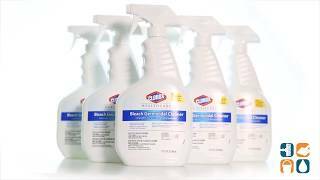 Dispatch Hospital Cleaner Disinfectant with Bleach is EPA-registered to kill multi-drug resistant organisms (MDROs) in just one minute, and Clostridium difficile spores in 5 minutes. Dispatch is a unique, stabilized sodium hypochlorite and detergent solution that kills pathogens fast — with a one-minute contact time for a broad range of microorganisms, including TB and MDROs such as Acinetobacter baumannii, Enterobacter aerogenes, VRE and MRSA. Dispatch is premixed, ready to use and is similar to the 1:10 bleach solution strength that is recommended by CDC guidelines for effective disinfecting. Dispatch contains an anticorrosive ingredient that makes it less damaging to surfaces or equipment than conventionally prepared bleach solutions. Great for surface disinfection in our surgery center.